An Excellent Utility for SQL Database to Repair Corrupt MDF Files of SQL Server and Make the Database Accessible. Successfully runs on Windows 2000/2003/XP/Vista/7/8/8.1 & Windows 10. MS SQL Database Recovery tool is a powerful and most recommended tool to recover data from corrupt MDF database from MS SQL Server. It is effective & perfect solution for damaged MS SQL Server database recovery and can be used as free mdf file reader tool. 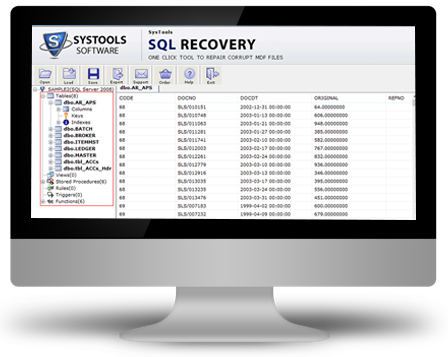 SQL recovery tool firstly scans & examines corrupt or damaged MDF file, then all the information that can be recovered using SQL Database Recovery Software is previewed on screen. Using SQL Database Repair tool users, can recover deleted records from corrupt MDF file and can save them in a separate SQL script file. SQL repair tool can also be used to repair the suspect database. Recover corrupted data like tables, views, stored procedures, rules, indexes, user defined data types and triggers from corrupt MDF database with SQL MDF recovery software. Restores & extract SQL data from corrupt SQL databases. It is a tremendous MDF File and NDF file recovery tool to repair and recover data from SQL Server database. Intently recovers tables, views, stored procedures, rules, user defined data types, triggers, indexes. Allow recovering SQL table's data which is deleted accidentally or unwillingly. Helps users to recover data from corrupt or damaged MDF databases of MS SQL Server 2000, 2005, 2008, 2012, 2014, 2016 & SQL 2017 and also export it into these versions. SQL recovery tool allows users to preview all information such as System Tables and User Tables, Stored Procedures of corrupt MDF file. SQL Recovery Software creates script files and restores all the information from corrupt MDF file to script file which can further be exported to SQL Server easily. SQL Recovery tool can easily support advanced data types like geometry, Datetime2, hierarchyid, sql_variant, geography & datetimeoffset with Unicode XML and ASCII data types. After repairing .mdf file using SQL database repair tool you will be able to migrate SQL Server database from one Server to another with just a few clicks. Why We Need SQL Database Recovery Tool? Try SQL Repair Tool to recover SQL database from Suspect mode and also repair corrupt .mdf file. How to Repair Corrupt MDF File in SQL Server? Click on Open button to select the MDF file. Choose the corrupt or damaged MDF file and click on Open button. The trial version of SQL Database Recovery Software offers to recover & repair corrupt MDF file as well as gives a preview for validation only and allow exporting 25 records of each table with 5 other database objects. Do I need to install SQL Server on my PC to recover data from corrupt MDF file using SQL Database Recovery Software? No, the SQL database recovery tool is a standalone program and doesn't require SQL Server environment. Can I repair MDF file of any size using this tool? Yes, SQL recovery software doesn't impose any file size limitation for corrupt .mdf file and can able to repair & recover .mdf file of any size. Can I recover corrupt SQL Server database or repair suspect database using this tool? Yes, SQL .mdf recovery tool can easily recover the database from suspect mode if the DBCC checkdb failed to perform consistency check on the database. Is It possible to recover data from Wallet Ransomware attacks? If the demo version of SQL MDF repair tool previews the details like Tables, Indexes, Views etc of affected .mdf file, then you can purchase the full licensed version of the software. Is it possible to preview the recovered data without SQL Server environment using SQL Recovery tool? Yes, SQL .mdf recovery tool previews the recovered database objects like Tables, Stored Procedures, Functions, Views, Triggers etc without SQL Server environment. But yes, you need to have SQL Server installed on your machine while exporting the recovered database objects into SQL Server Database. Is it possible to fix SQL database error like 823, 5172, 8946 with this SQL recovery utility? Yes, SQL database repair tool is capable to fix header corruption error 5172, 8946 and other I/O failed SQL Server error 823. Does the SQL recovery process of this software make changes on original .mdf file after recovery of corrupt .mdf file? Software doesn't make any changes on original .mdf database file while processing it for recovery. the SQL database repair tool creates a new .mdf file on the destination location while exporting the data from it. How to convert .mdf file into a .sql file using this SQL database recovery tool? Yes, This MDF recovery tool not only repairs .mdf file, it can also generate .sql script from .mdf file. 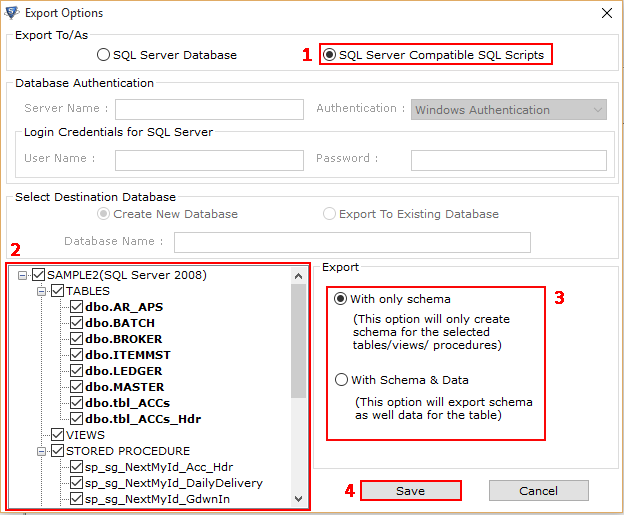 You just need to select the option to Export as SQL Server Compatible Script. Then, Select the required component that needs to be converted to .sql file. Now, select With Only Schema to export only Schema/Structure of your database components. In case, you desire to store the components of database with both schemas as well as data, then you are instructed to choose With Schema & Data option. Now, hit on Save to let the tool begin the process of converting .mdf to .sql script. Can I use this SQL repair tool to migrate SQL Server 2008 database to 2012? Yes, SQL recovery software is capable to migrate SQL Server database from one Server to another, As the tool is capable to repair and open MDF file of SQL Server 2017, 2016, 2014, 2012, 2008r2, 2008, 2005 & 2000. The package of SQL Server products has made the Database administration tasks much easier. 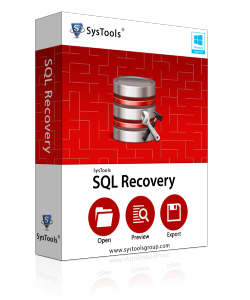 Now all the Server related issues get resolved with this SQL database recovery software. Whether it is MDF/NDF corruption, data loss, accidental deletion, the SQL Server suspect database repair tool is a compact solution for all DB troubles. I recovered my data from ransomware attack, as I didn't have much knowledge about ransomware attacks and its encryption process. after being victimized by ransomware attack on my PC, I found that the database files (.mdf) have been encrypted into .wallet file extension. I did search a lot on Google for its solution but could not succeed until one of the forum expert's suggested this SQL Recovery tool. going with this helpful utility made my day successful. Thanks to developers for creating such great utility. The best part of this SQL database recovery software is, it can convert MDF file into SQL script, I was also facing such situations where I need to export MDF database to .sql file and this SQL recovery tool made my work very easy. An excellent solution for me to migrate SQL Server 2008 database to 2014, As I am not a DBA and not much familiar with the Import/Export wizard of SQL Server to migrate SQL Server database from one Server to another. Thanks to developers for creating such a handy SQL repair tool. While deleting some of my duplicate records, I mistakenly removed some non-duplicate records from database tables without taking the backup first. Luckily! I got SQL Recovery tool. An amazing utility that recovered all my accidentally deleted records back to the table. Great product with great service!